God’s invisible qualities! | Thy Word is Truth! 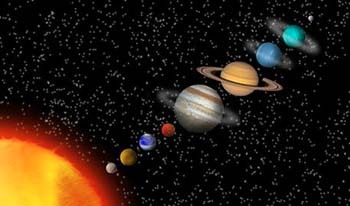 When an astronomer peers through his telescope and discovers eight lifeless rocks orbiting our Sun along with billions of other planets in the universe and finds no evidence of a planet as unique as Earth, I would think that he HAS to consider the possibility of a supernatural creative work. Even when I was a child examining the fragile environment wrapped around this planet we call Earth and it’s balance of life maintained second by second, I have always been compelled to acknowledge that we are all wonderfully and fearfully made. Earth is by no means some random explosion of elements which over billions of years happened to evolve into this remarkable planet. Add to that, living creatures with DNA so complex that it staggers the mind to think it could have been a cosmic crap shoot of chance. No amount of time would lend itself in support of the arguments of contemporary evolutionary claims. Scripture says that the Christian has creation itself as ‘a priori’ evidence of the existence of a transcendental creator/sustainer: Romans 1:20- ‘Since the creation of the world God’s invisible qualities- His eternal power and divine nature, have been clearly seen, being understood from what has been made, so that men are without excuse. Although they claimed to be wise, they became fools.’ The Christian has so many incomparable reasons for faith as we live our lives as visitors enjoying a brief moment in the corridor of time. Let us enjoy the blessings of holding unswervingly to His truths! Hi Jim, would it be ok for me to quote your above comments under the ‘God’s invisible qualities’ in a book I am writing? I will naturally attribute the comments to your name. Your message fits perfectly with what I am trying to convey in the book. Please e-mail me to confirm if this is ok: ckrogh@talk21.com.